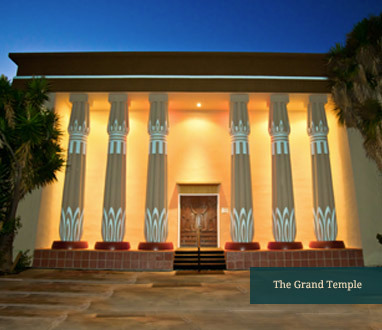 The Grand Temple is entered through an impressive foyer resplendent with elaborate murals and beautiful statuary. Rosicrucian artists created all of the Temple’s murals and artwork. The inner temple—the lodge room—with its ceiling resembling the nighttime sky, is 90 feet in length and completely tiled throughout. The temple honors the four directions—North, South, East, and West. In the center is the Shekinah, symbolizing the presence of the Divine in our midst. Rosicrucian temples or lodge rooms are often built in Egyptian architectural design to commemmorate the traditional origin of the Rosicrucian Order in the mystery schools of ancient Egypt. In such lodge temples, reminiscent of a past civilization, Rosicrucians study ancient truths and the most recent disclosures and revelations, both philosophical and scientific, of natural and cosmic laws. The architectural design of Rosicrucian temples and lodge rooms is also symbolic of the continuous search for Light by humans throughout the ages.